Indian Lake is great place for year round living or your mountain vacation hideaway. The lake is a 5 mile long horseshoe, 750 miles in area with 20 miles of shoreline. Residents enjoy water skiing, tubing, personal water crafts, and fishing from their boat docks or aluminum boat lifts – just about every imaginable water sport. All of this fun is more enjoyable with trusted Metal Craft Indian Lake docks and lifts. For over 20 years, Metal Craft Docks has afforded Indian Lake residents more time to enjoy their lakefront properties thanks to our full product line of stationary piers and boat and jet ski lifts. Metal Craft Docks have been installed on Indian Lake for many decades. Our stationary and floating docks feature all aluminum construction with a superior non-skid, baked poly acrylic finish ensuring boaters safety as they enter and exit watercraft. Metal Craft Docks feature aluminum interlocked supports for added strength and rigidity. Our unique heat-sink technology draws heat away from the aluminum surface so the decking maintains an ambient temperature when walking on the surface during the dog days of summer. Fastened and bolted construction makes replacing parts easy after many decades of hassle-free use. With four standard deck widths, three standard lengths, and three colors to choose from, you can configure the dock of your dreams! Contact Metal Craft Docks today and we will be happy to assist you in choosing the dock design that best suits your needs. Metal Craft aluminum boat hoists are manufactured to lift boats weighing up to 5000 lbs. and jet skis up to 1200 lbs. Add a canopy onto a Metal Craft boat lift and an electric winch drive motor and you’ve just bought yourself more time on the water enjoying your day! Our boat lifts feature all aluminum structural components, nylon pulleys and aircraft quality stainless steel cables for superior construction. Additional accessories such as side guides, bunks and pontoon kits are available for all boat lift models. Stop buy the marina today to see which lifts are in stock or contact Marc with the specifications for your boat and he’ll be happy to assist you in choosing the model that best suits your needs. Metal Craft Docks has been designing, engineering and manufacturing dock systems for over 80 years! Metal Craft Docks is a family owned and operated business priding ourselves on exceptional quality, design and outstanding customer service. All of our docks and lifts are made entirely of aluminum so they are light-weight making installation and removal for storage easier. We are proud of the craftsmanship that goes into every one of our products manufactured at our Mentor, Ohio facility. 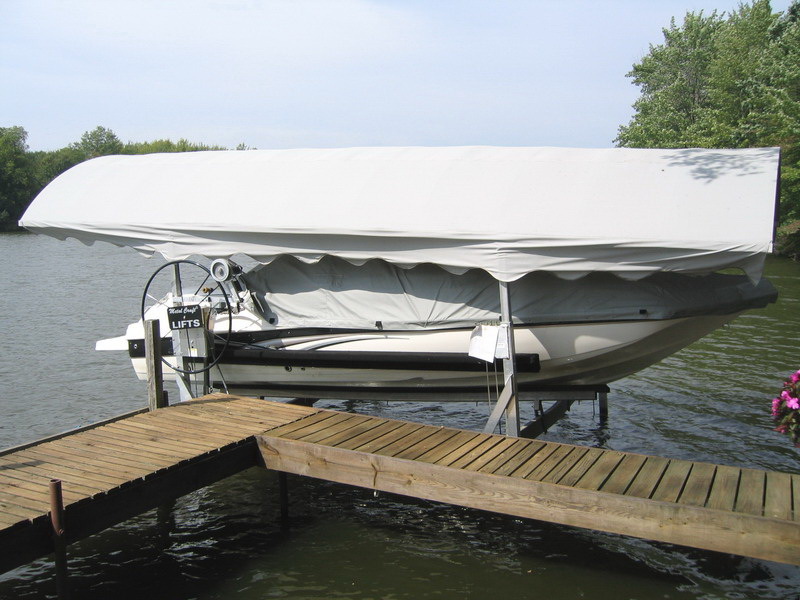 When you purchase Indian Lake docks and lifts by Metal Craft, you are making an investment. We know you will be happy with your Metal Craft purchase for decades to come!